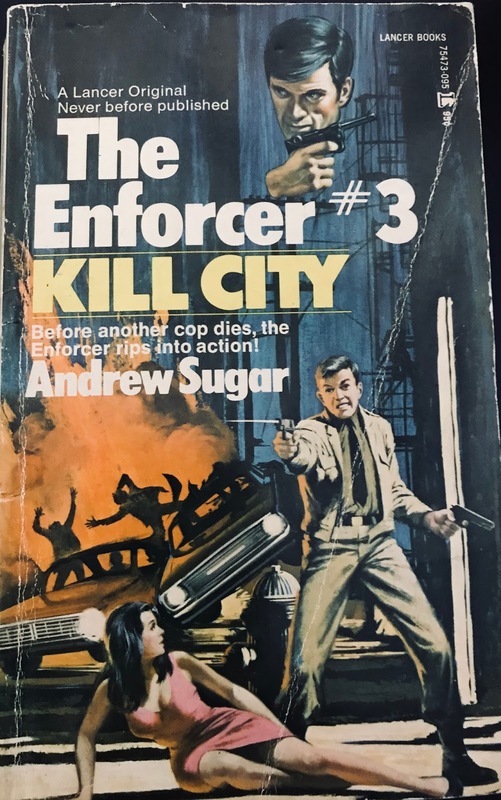 Andrew Sugar's third entry in his vigilante series 'Enforcer' is “Kill City”, released in 1973 by Lancer. 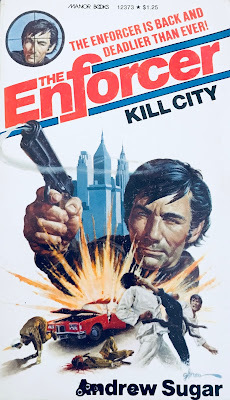 Like the prior two books, “Kill City” was purchased by Manor and reprinted in 1976 with new, more superior artwork courtesy of George Gross (who did early 'Executioner' books before Gil Cohen took over). Gross's artwork really captures the feel of the book, detailing many of the action sequences found within. The red, white and blue color scheme is important to the story fundamentals – Enforcer Jason is preventing a mass terrorist attack on major US cities. With the obligatory ticking time bomb comes some political intrigue and subtext regarding a nation divided by color. Like the series debut “Caribbean Kill”, the novel starts by revealing a wounded Jason after the finale showdown. The author paints enough sketchy brush strokes to give us a feel of the story, but leaves all the details and plot planning for subsequent chapters. In those, Jason is mugged off-assignment and rescued by a vigilante force called The Patrol. In the incident, the mugger shockingly turns the gun on himself, committing suicide on the sidewalk. Perplexed, Jason takes the mystery to the institute (the place where they make a new body for Jason every 90 days in an effort to fight crime worldwide). Collectively, the institute formulates a tactical infiltration of The Patrol. Combining the institute's resources, Jason utilizes a black associate named Calvin to tackle the assignment. The Patrol is actually the Caucasian vigilante force. There's also an African-American version stereo-typically deemed Brigade of Brothers. While the surface level indicates no foul play, Jason and Calvin infiltrate the two forces, black and white, and unveil a global conspiracy to detonate Suicide Stimulators (called Suzies) across major US cities. The overall effort is conducted by one of Jason's rivals from the first book. 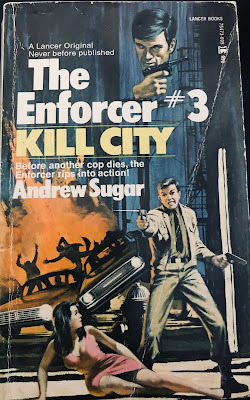 Sugar really nails this one, fetching the same sort of intrigue, mystery and explosive action as the predecessor, “Calling Doctor Kill”. While the clone bodies, Jason's body jumping and his masterful art of Ki have all been elements of the prior installments, these inclusions are more expanded with “Kill City”. Beyond what we already knew, Jason stumbles on a few new tricks while fumbling with the two criminal factions. Sugar, always explicit, throws in some X-Rated steam as Jason works over Janet, his love interest from book two. Overall, “Kill City” is a thrill-ride of epic proportions and continues to catapult the series into the higher echelon of the genre. Thanks to Bob Deis of MensPulpMags.com for the assistance on the book's artist and artwork.